Last week I watched the movie The Founder about how Ray Kroc turned McDonald's into the fast food empire it is today. A lot of people have said this movie is anti-capitalism or anti-free markets. I disagree. Yes, according to the movie, Kroc did some not completely ethical things. But he didn't do things that hurt people. He claimed he started McDonald's (he didn't) and he claimed he came up with the "speedy system" that made McDonald's the first fast food restaurant (he didn't). None of that is illegal, either. I think what a lot of people worry about is the McDonald brothers. But they actually came out pretty well. They were doing okay, I suppose, before Kroc came along. But they tried to franchise and it didn't work. Kroc managed to franchise McDonald's and after some mistakes and false starts, he figured out how to make it work and how to make it profitable. A lot of people got richer (or rich) and a lot of people got jobs because of what Kroc did. The McDonald brothers each got $1 million after taxes in the final buy-out. Now days $1 million isn't that impressive. But in 1961, when Kroc bought out the McDonald brothers, that $1 million was worth more than $8 million in today's dollars. And they each got that much. If they wanted, they never had to work another day in their lives. In today's terms, invest $8 million at 5% interest and you'd make $400,000 a year. Live off $300,000 (you can live pretty well on that) and reinvest $100,000 a year to keep your equity growing. And the McDonald brothers would have never made that kind of money doing what they were doing until Kroc took the restaurant national. 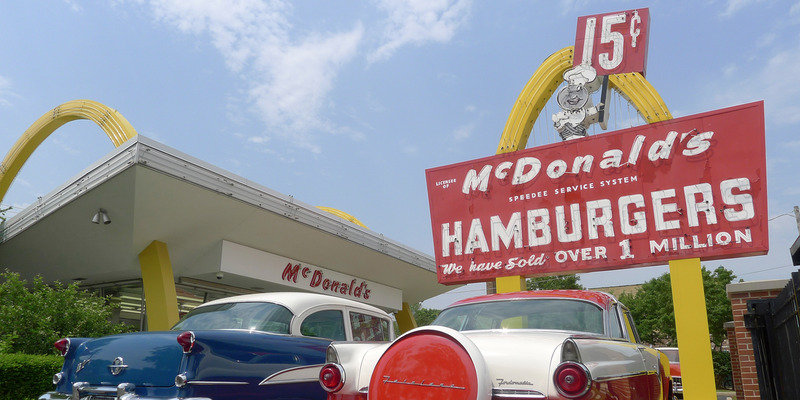 However, the McDonald brothers also asked for 1% of McDonald's profits "in perpetuity." That is, forever. Kroc said that would have to be a "handshake agreement" because his backers wouldn't allow it. And the McDonald brothers went for it. Now I was in business and I know a "handshake agreement" isn't worth the paper it's not written on. If it's not written down, it doesn't exist. The movie makes it sound like Kroc, who became a billionaire, screwed the McDonald brothers out of that 1%. But the McDonald brothers never should have agreed to a "handshake agreement." Business is brutal. It has to be. The McDonald brothers weren't good enough businessmen. Ray Kroc apparently was. And look what Kroc accomplished. How many people had their first job at McDonald's? How many people got rich as McDonald's franchisees? I look at that and think Kroc did an amazing thing that the McDonald brothers couldn't. Micheal Keaton does a great job playing Kroc. Laura Dern plays his first wife (who Kroc divorces to marry someone else, and yes, that was a jerk move). It was a well-made and interesting movie. And if you look at it from a business perspective, a very interesting movie.